1730T | LCR Meter | QuadTech Inc.
10 Test Frequencies, User selectable: 50Hz, 60Hz, 100Hz, 120Hz, 1kHz, 10kHz, 20kHz, 40kHz, 50kHz and 100kHz. 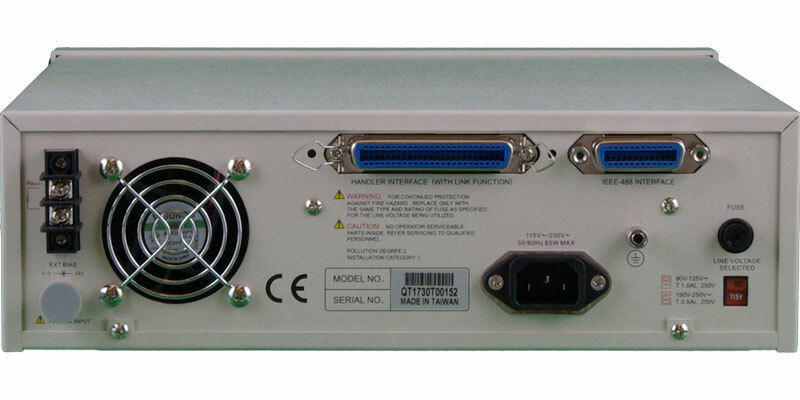 14 Measurement Parameters: Measure and display two of 14 impedance parameters simultaneously with a basic accuracy of 0.1%. Test results can also be shown as Deviation or %Deviation from nominal value. LCD Display: Large, high resolution graphic display for clear, concise results and user friendly menu interface for easy programming. Setup Store/Recall: Store/Recall up to 50 test setups from instrument memory. Lockout front panel to ensure procedures are run the same way every time. 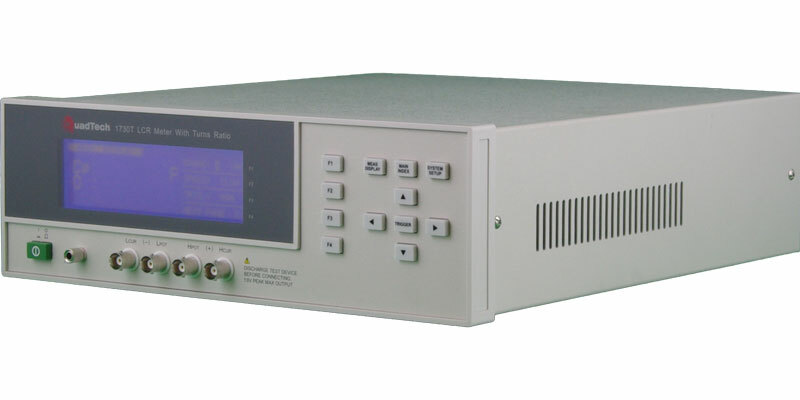 Programmable Source Impedance: Program tester impedance to 100Ω, 100/25Ω, 25Ω or 10Ω constant current when comparing results with measurements made on other testers. Measurement results can vary significantly based solely on the source impedance of the tester being used. Voltage/Current Monitoring: Use the test signal monitoring function to display the actual voltage level across and current through the DUT. DC Bias: External and internal DC Bias voltage from 0-5V, permits capacitors to be tested under real DC bias conditions. Open/Short Zeroing: Reduce the effects of error sources (stray admittance/residual impedance) between the DUT and the calibrated connection to the measuring instrument. Fast Testing: Select from one of three measurement speeds: slow, medium or fast for varying degrees of accuracy and speed up to 62 measurements/second. Interfaces Standard: The 1730 unit includes IEEE-488 and Handler interfaces for adaption into production environments or remote control applications.